As someone who participates casually in the board game scene, I love simple games, and especially ones that aren’t too messy to clean up. 2niverse recently released its 2-player dueling tabletop game Tiny Ninjas, which allows you to fight with a friend in order to see who reigns supreme. With its simple setup, fun artstyle, and strategic but quick gameplay, this is a game that is aimed for those who want an addictive casual card game experience. Tiny Ninjas pits up to two players in a fight to the adorable death as they try to whittle their opposing force’s health points down to zero. You each start out with five cards as the youngest person decides whether to be the attacker or defender first. When attacking, you can play any card into the arena, discarding it but also playing its attack or special command; the amount of damage can either be fixed or determined through one of two dice, a multicolored shuriken or a black and white kunai. The shuriken dice has three colors with two sides dedicated to orange, green, and purple colors, while the kunai is divided into three white one-kunai sides, two black two-kunai sides, and one black three-kunai side. Damage is specified by red and blue types, which can only be defended by a card with the same colored shield (or yellow, which can defend against both). The defender can either play a card from their hand and roll in order to determine how much damage is nullified, or can take the full damage and adjust accordingly. The attacker can play as many attacks as they want, but once they declare their turn finished, the roles switch and only the defender turned attacker can replenish their hand to five cards. This results in a “press your luck” strategy that balances attacks and defense; if you waste all your cards on your first turn, you’re stuck at the mercy of your opponent, as you’ll be forced to take full damage for every attack. However, you also don’t want to dawdle too much, as your opponent can find an opening and attack when you least expect it. These constantly changing phases will put both players on their toes, and rewards both offensive and defensive strategies. Cards that are dependent on dice rolls to do damage are pretty varied. While most common cards have a “roll die, deal damage” mechanic to them, a few special ninja can execute other effects. The monkey ninja can roll twice, adding damage based on how any kunai you roll, while the ghost ninja has an all or nothing attack based on if you get a white or black kunai from the same die. These drawbacks mean that even the strongest cards, such as the legend ninja who can deal up to 10 damage (which is an instant win if an opponent can’t counter), can end up dealing little to no damage based on an unlucky roll. On the other hand, fixed damage and defense cards are surefire ways to get a hit or defense point in, but are weaker. It’s a pretty balanced system that encourages experimentation and risk-taking in order to succeed. While most cards deal damage based on dice rolls, there are some other cards that do other effects. The alien ninja, for example, can abduct an opponent’s ninja into your hand, while a medic can heal you instead of attack your opponent. In addition, you can select a colored sensei (red, blue, green, and purple) to assist your game, from buffing one attack to defending some damage. 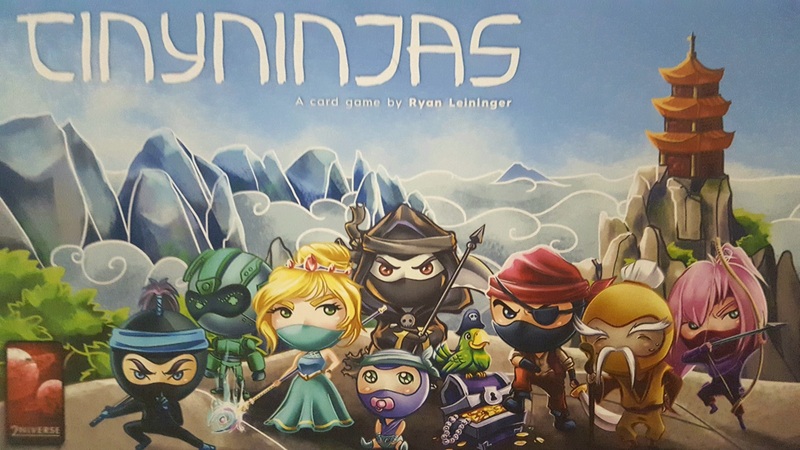 These unique ninja cards and sensei mechanics diversify the game but don’t make it too complicated for those that might not get the hang of it at first; in addition, you can also take away advanced ninja cards from the deck and just play with the base set of ninjas. If you want additional rules, the game rulebook also includes some modified rulesets in order to change up the game, such as a blitz mode where you can only attack once per phase, or even a solo mode where you fight against randomly selected cards from the drawpile. The solo mode itself is a little undercooked, as it isn’t as dynamic as the two-player duel mode; the random opponent will always have to do certain actions which could be counter-intuitive; for example, if a princess ninja is played (which can either attack or heal up to 6), the random opponent will always choose to heal if under 6 health remains, even if the opponent could win with said attack. It’s something that could use a little more work, but is serviceable if you don’t have anyone with which to play. 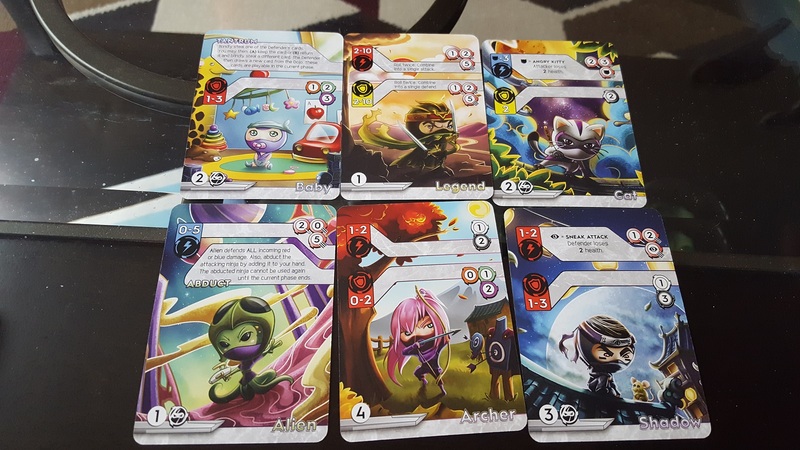 Regarding the presentation, Tiny Ninjas sports a unique artstyle, with chibi art gracing the cards. They’re cute and adorable, and fit well with the mini-sized box that houses the cards and other components. The package claims that you can play with everything right in the box, and for the most part, it works. The box is sturdy and fits the 60 card deck inside, with pieces like health counters, a couple of dividers that hold the other side of the box, sensei markers, and dice jammed in there as well. This is perhaps the part that I was a bit disappointed in, since the second half of the box is where you can roll dice, but my friend and I opted just to roll them out of the box most of the time. 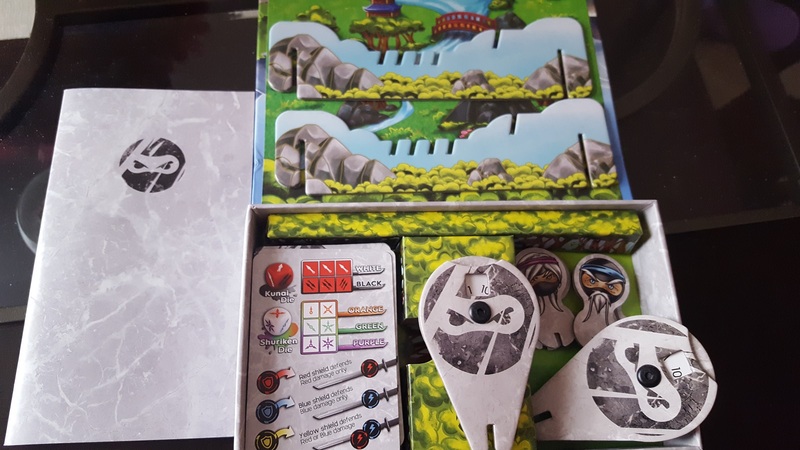 On the other hand, the side dividers, while thematically appropriate with a mountain theme and holds the health and sensei markers just fine, are slightly flimsy and the box isn’t fully flat as a result. The card dividers are made of a weaker material than the side ones, and they might wear off pretty easily if you move them too much (which might be often since the dice are housed below these dividers). This isn’t that much of a dealbreaker, but it can be a bit unstable if you’re planning on playing in an area that’s cramped. 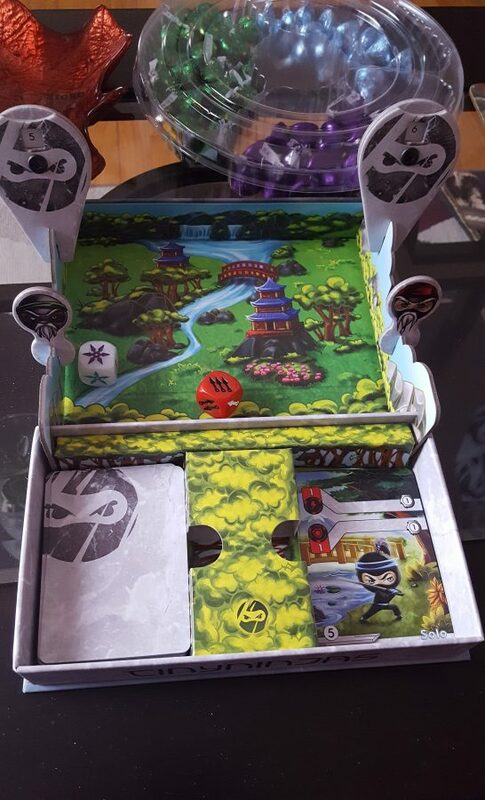 Tiny Ninjas is a wonderful game for two players that want some quick fun with minimal setup. The game’s charming artstyle and easy-to-play mechanics make this one a hidden gem.